It’s true! Watch our Career Videos to see how – we chat with real people about their jobs so you can learn right from the horse’s mouth what it’s like to be a teacher, a PR person, a video game tester, an interior designer, a football coach and more! Hover your mouse over CAREER VIDEOS in the navigation or click on the Topics of Discussion in the right sidebar to find video interviews that interest you. Just like Halloween, event coordinator Jessica Alpert recently told us, if you act the part you can play the part! 2) Taking chances pays off. Anyone who puts themselves out there by wearing any kind of Halloween costume is taking a chance: of getting laughed at, of feeling stupid, and of creating new friends due to the shared ridiculousness of the “holiday”. It’s that chance-taking that makes Halloween pay off as a fun “holiday”. With your career it’s good to take chances too -you never know how it will pay off if you reach for the unreachable or simply step outside your regular routine once in a while. Remember: nothing ventured, nothing gained. 3) Paying your dues pays off. Investing time into planning out a good Halloween costume will lead to more laughs, conversations and fun as opposed to just grabbing the first mask you can find on the shelves of Target. Similarly, investing time into researching the right career, building a foundation once you get there and then developing your knowledge and skill set will lead to a better, more satisfying career. 4) You can pave your own path. You can buy a pre-made Halloween costume in a store or you can take powers into your own hands and make something at home. Similarly, you can apply for a clearly-defined job and go work for someone else or you can create your own career and go the entrepreneurial route. 5) You can be adventurous or play it safe. You can create an adventurous, odd costume that, like modern art, requires a few steps of thought for anyone to have a clue as to what you’re supposed to be. Alternatively, you can play it safe and be Lady Gaga or whatever superhero everyone else is going to be this year. The adventurous costume will probably get more attention and lead to more interesting conversations with random people. The other route will lead to easily fitting in with lots of others at whatever party you go to, yet still could achieve your goals of having fun and getting laughs. Just like in your career, you can aim for the more unique, adventurous path in life….or take the safe route and aim for the stable life. One isn’t any better than the other; it’s just a matter of finding the right career fit for you. 6) You can make a change! Just because you were Bella Swan or Michael Jackson last year doesn’t mean that you can’t be Snooki or The Situation this year. You have the freedom to change costumes when you’re ready for something new. Same with careers. Just like you would pick a new costume that currently entertains you, you should choose a career that matches your current skills and interests. 7) Things might not work out as planned. At a 70s costume party last year, I tried to be a homeless Vietnam vet since I figured the disco and leisure suit crowd would be well-represented. Problem: everyone thought I was Fidel Castro! After explaining 25 times that, “No, I’m not Fidel Castro,” I pulled off my fake beard and threw it on the floor to re-tool my look. This could also happen to your career! You might get yourself on a path only to learn that it doesn’t align with your strengths…or your interests change…or you choose to work for Friendster right before Facebook launches….or for a record label right before Napster emerges….or you start selling SUVs right before gas prices spike… Careers don’t always work out as planned – and when that happens, you can retool your career. 8] There are consequences for your actions. If you eat 300 twix bars and 2 bags of candy corn while downing malt liquor at a costume party, you’ll outgrow your designer jeans, drastically mess with your blood sugar and potentially wake up in a pool of vomit. If you show a similar reckless disregard for your career, you might find your career train derailing. 9) You can choose where to go. 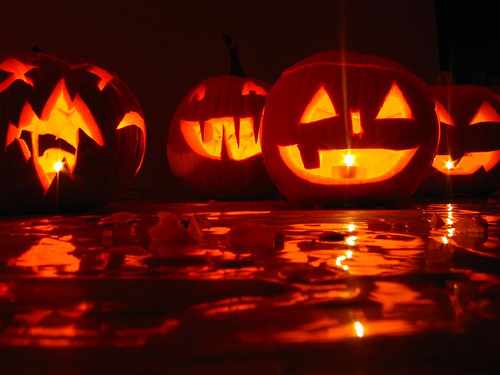 There are usually plenty of Halloween parties to choose from as well as places to trick-or-treat. If you don’t like the people or candy at one, go to another. Same goes for companies and cities. You can and should choose a city and career lifestyle that fits you. 10) You don’t have to accept every offer. Just because every house you trick-or-treat at is offering you SweeTarts or those damn, pumpkin-shaped candy corns doesn’t mean you have to take them! You can say “no” and wait to see what the next house has to offer. Same goes with your career. You don’t have to jump at the first thing that comes your way, or accept something as-is just because it’s offered to you. Do you have any Halloween-career analogies to share? Please do in the Comments!